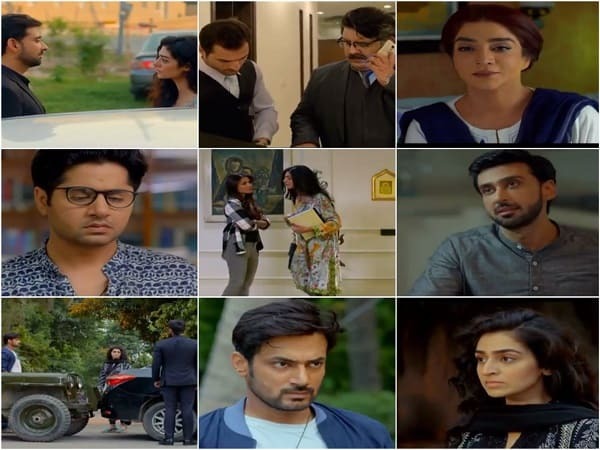 Tau Dil Ka Kya Hua Episode 16 Review – Interesting! Tau Dil Ka Kya Hua continues to be unpredictable, unusual and intriguing but it isn’t the same without Dariya. Dariya and Faris’ relationship as well as their interactions were the highlight of every single episode. Their on-screen chemistry and the way these characters were translated on screen made their scenes a treat to watch and I must say that even though Sami Khan was brilliant as usual but nothing can beat the magic Faris and Dariya’s scenes created on screen. Although Dariya kept on saying that she couldn’t stay forever but even then I was hoping that she will stay in the picture somehow. This episode covered Lubna and Faris’ interactions and by the end of the episode Faris found out that Lubna and Saif were engaged. This entire development was shown superbly. Faris noticed Lubna’s reaction when Saif hit Faris’ car and he knew instantly that she knew him. Later on the resignation and most importantly everything that Lubna said to Faris about Saif getting away with taking Maya away from him is going to be the reason why this time around Faris will not let Saif decide how things run in his office or life! Lubna, like every other girl Faris meets, seemed to like Faris instantly – her conversation with Baila said a great deal about what she thought about Faris. The fact that even with all his flaws Faris is a charming man makes it easy for the viewers to understand why it is impossible for someone to not like him! Lubna is the only woman Saif has ever been serious about therefore now there is a way for Faris to take revenge from this man however so far, Faris has been shown as someone who does not believe in playing games therefore whatever he does, he will probably do it genuinely to help Lubna and not just because he wants to teach Saif a lesson! Maya’s mother’s dialogues were the most meaningful as well as powerful dialogues in this episode. Although Farah Shah tends to go overboard at times and I do not like the way she delivers her dialogues but even then those dialogues showed that this woman knew her daughters only too well. She already had a feeling that Maya was about to do something outrageous to get Faris back therefore in her own way she tried to warn her. Although Maya thinks she is very intelligent but the fact is that she is constantly letting other people make her decisions for her. Tipu might appear to be a simple person but he is actually much more clever than Maya, he knows how to play with people’s feelings and how to use a situation to his advantage. It is great watching Imran Ashraf playing roles in different drama which are poles apart. He is a remarkable actor who is versatile as well. Ayeza Khan’s makeover in this drama is right on point and she has given a flawless performance throughout. Maya’s character however isn’t as strong or appealing as that of Dariya’s or even Baila’s character. Rehan Sheikh is also an exceptional actor who always gives a solid performance. No one could have played Uncle Siraj’s role with more finesse than him. This episode had some remarkable performances, powerful dialogues and interesting scenarios to its credit. Just like every other episode of Tau Dil Ka Kya Hua this one too was directed brilliantly. I am waiting to see Faris and Saif face to face and hoping that we will get to see Dariya soon!